Biopolymers, produced at least partially from renewable resources, have gained attention as society, industry, and governments realize the need to move away from petroleum-based materials. There are two main types of biopolymers — bioreplacement polymers and bioadvantaged polymers. Bioreplacement polymers are produced using tools like synthetic biology and catalysis. In this approach, the polymers differ from their petroleum-based competitors only in the age of their carbon. However, achieving cost parity is extremely difficult. Bioadvantaged polymers are derived from monomers nonexistent or prohibitively costly in the petrochemical world, such as alginates, cellulose, chitin, unmodified or minimally modified vegetable oils, fatty acids/diacids, polysaccharides, proteins, and starch, among others. They may have physical and chemical property combinations unmatched by any material known today. These polymers present both the greatest challenges and the greatest opportunities for success. Researchers at Iowa State Univ. (ISU) and the Center for Bioplastics and Biocomposites (CB2), an Industry-University Cooperative Research Center funded by the National Science Foundation (NSF), are investigating bioadvantaged polymers. Using controlled free radical polymerization chemistries, the researchers have developed a family of thermoplastic homopolymers, statistical copolymers, and thermoplastic elastomeric (TPE) block copolymers (BCPs) that employ acrylated vegetable oils and glycerol. Due to their high level of functionality and ability to copolymerize, these materials are highly tunable and can be formulated to serve a wide variety of applications. ▲ The new processing facility at Iowa State Univ.’s Bio­Century Research Farm for production and commercialization of soybean and glycerin-based biopolymers has a production capacity of 500 gal/day. TPE BCPs have a soft block that bridges two rigid blocks, for example, poly(styrene-b-butadiene-b-styrene) (SBS) or poly(styrene-b-isoprene-b-styrene) (SIS). The soft segments exhibit low glass transition temperatures, often below 0°C. The research team produced bio-based soft segments with glass transition temperatures of roughly –45°C by replacing butadiene or isoprene with modified vegetable oils or glycerol. These biopolymers can be used in adhesives, films, packaging materials, sealants, additives, rubbers, and many other related applications. The ISU team is working with CB2, the Iowa Soybean Association, United Soybean Board, U.S. Dept. of Agriculture, and ten companies to evaluate the soybean and glycerin-based bio-polymers as curable waterborne glues and pressure-sensitive adhesives. In preliminary tests, the bio-polymers’ adhesion properties were comparable to those of petroleum-based adhesives. For example, the team has created a curable waterborne glycerin-based adhesive that provides a high-performance formaldehyde-free alternative to phenolic resins widely used in wood composite materials like plywood and oriented strand board. Scale-up efforts are currently underway, with a goal of generating hundreds of pounds of adhesive in the next few months. The team is also working to produce full-scale wood panels for evaluation by major wood composite manufactures. Another application includes asphalt modification. Currently, SBS is added to asphalt to improve high-temperature performance. Using a bio-polymer instead of SBS improves not only high-temperature performance, but also aggregate adhesion and cracking resistance in cold climates. These benefits are crucial in lower-quality asphalts, including recycled asphalts, which are susceptible to cracking in cold temperatures. Additionally, biopolymers can be dissolved in commonly used liquid additives to form a pumpable solution, greatly simplifying the polymer modification process. 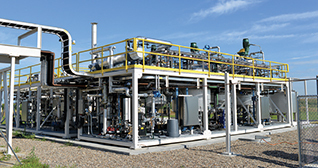 The ISU team has constructed a 1-ton/day biopolymer processing facility on campus to manufacture material for demonstration projects nationwide. Commissioned in summer 2015, the facility achieved its first successful production run in spring 2017. The team recently received 50,000 lb of high oleic soybean oil from an industry partner that will be upgraded to the world’s first polymer asphalt modifier that can be blended at the construction site rather than the terminal. The polymer modifier will be used in a few paving projects in the Midwest throughout the late summer and early fall 2018. The researchers and their corporate partners are also planning a test pavement section at the internationally renowned National Center for Asphalt Technology Pavetrack facility in Opelika, AL, which could further accelerate acceptance and adoption. This work was partly funded through the NSF Industry-University Cooperative Research Center (IUCRC) Program. This article was prepared by the National Science Foundation in partnership with CEP.